The Dead Sea Scrolls were discovered in a series of twelve caves around the site known as Wadi Qumran near the Dead Sea Between 1949 and 1956. These scrolls, approximately 800 manuscripts contained early copies of the scriptures. Most of the texts on the scrolls were written in Paleo Hebrew with some in Aramaic, a few in Greek and some in Latin. Most of the Dead Sea Scrolls are NOW located at two sites in Israel. One is the Rockefeller Museum in East Jerusalem, which is under the authority of the Israel Antiquities Authority and for which access is grated only to certified researchers. 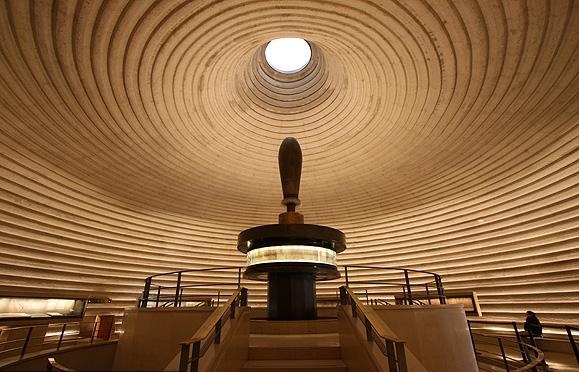 The other is the Shrine of the Book at the Israel Museum in West Jerusalem. Scholars assembling and examining the Dead Sea Scrolls at the Rockefeller Museum in East Jerusalem. circled on the photo. This is of Psalm 119:45-64 dated around the 1st Century BC.